For programs where information needs to be accessed or collected after the submission of the application, Follow-Up Forms can be created and their completion can be tracked via the Followups Tab. Follow-up Forms are used to collect data after an Application Form (a form that requires an applicant or entrant to sign up and log in to complete) is completed. The form(s) are associated with a particular folder in the workspace and will appear on the user's login menu once they have been moved into that folder. Alternatively, you can email the URL of the form directly to the applicant. The applicant/entrant will need to log in with the same credentials that they utilized in order to access the Follow-Up Form. Below is an example of what the Followups tab can look like. In the view drop-down menu, you can select to see entries from all folders or from a specific folder, in this case we are only looking at entries in the video folder. The chart represents completed forms with a green dot and uncompleted forms with a red dot. If there is no dot next to the entry name, then the applicant was not assigned to that Follow-Up Form. This is a simple way to visually track your Follow-Up Forms. When we cover Workflow, you will see that you can also automate movement of applicants into a new folder (such as a Follow-up 1 Complete folder) based on submission of the Follow-Up Form. In the Followups tab, click on the Manage Form button. If you don't see the Followup tab in your Workspace, you will have to show the tab in Manage Tabs. To do this, click on Manage Tabs, find Followups and click Show. The window will list any existing Follow-Up Forms. To add a new form, click 'Add Form'. To edit an existing form, click on the name of the form you wish to edit. To delete a form, click Delete. After clicking Add Form you will be brought to Add Form window (seen below) where you can edit the properties of your form. This is the same window you will be brought to if you click the name of an existing form to edit it. Name: In this field enter the name you would like to give to the application you are creating. Menu Title: The title of the form as you want it to appear on an applicant's menu. Note: this only shows on the menu if an applicant is in the folder that has access to this particular Follow-Up Form. Folder: You can assign this Follow-Up Form to either all applications, or you can choose to only show it for applicants grouped in a single folder. Start Date: Select a start date for this form to be available to applicants. If the start date is in the future, the form will not show on the menu until that date regardless of whether the applicant is using a direct URL or their login. 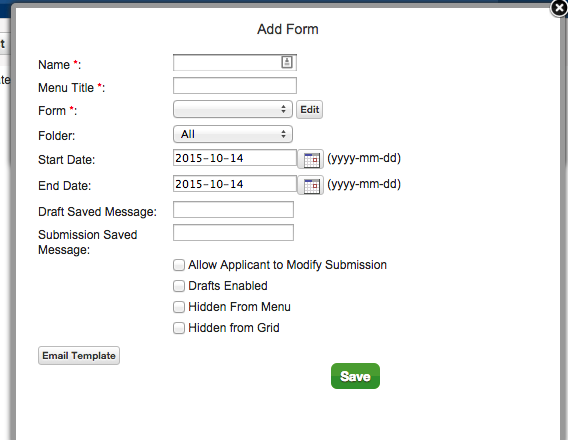 End Date: Select a date for this form to automatically become unavailable to applicants. Draft Saved Message: The message that will be displayed if the applicant saves a draft. Submission Saved Message: The message that will be displayed when the applicant submits the form. Allow Applicant to Modify Submission: If this option is checked, an applicant will continue to see this form in the menu after they complete the form, and may make changes at any time. Note: if you have Workflows setup based on this form, you will want to make sure that you consider whether you want the action to be triggered only when the form is first submitted, or also each time the form is modified and submitted. Drafts Enabled: If this option is checked, the applicant will be given the option to save the form as a draft. Hidden From Menu: If this option is checked, the form will not be available on an applicant's menu, and they will need the direct URL to the form in order to complete it. Hidden From Grid: If this option is checked, you will not see the form in the Followups tab grid to see the response status for the form. This option is usually only selected if you have a lot of Follow-Up Forms for your Workspace and want to limit your view to only the most recent Follow-Up Forms. Email Template: If you click on the Email Template button, the Subject and Message fields appear. You can create an email template, such as one that alerts the applicants that the Follow-Up Form is available for completion. This email will be the default email if this form is selected in the Contact window for Followups. You can set follow-up forms to open and close on a specific date. By default, the form would open at 00:00:00 EST (12am Eastern Time) and close at 23:59:59 EST (11:59pm Eastern Time). The usage of this feature is no longer recommended. If you want to automatically send an email when the Follow-Up Form is submitted, you will need to use Workflows. Depending on the scenario, an applicant may need to access a Follow-Up Form while the Application Form is still live, OR after an Application Form has closed. By default, on the End Date of an Application Form, the applicant loses access to their entire applicant portal. This means that when they access the main URL, they will be brought to a closed message and be unable to log in. If you would like for an applicant to continue accessing their applicant portal after the main form has closed in order to complete Follow-Up Forms, amongst other functions (access a PDF, monitor Recommendations, etc. ), you will need to change the default setting in the Application Form Settings. Access your Form Settings from the Application Form tab and go to the Advanced Settings section. Under "Applicant menu access" you will see two options: (1) Follow application dates; and (2) Always accessible. The default, "Follow application dates," will cause the applicant portal to close entirely at the Application End Date. The second option, "Always accessible," will allow an applicant to log in to their portal after the Application End Date. The Application Form itself will no longer be accessible, but the applicant will be able to submit Follow-Up Forms, etc. The quickest way to disable a Follow-Up Form for your users is by setting the 'Start Date' to a date years in the future or 'End Date' to a date that has passed already, or by changing the Folder to an empty folder. You may also remove a Follow-Up Form from the applicant's menu by checking the 'Hidden From Menu' option. Note: Disabling an application form will also disable any associated Follow-Up Forms.